When I was working in meal assembly, we went through a lot of Ziploc bags. The owner would go to Costco and stock up on boxes and boxes of bulk Ziploc bags. As we opened new boxes, the employees would be sure to tear off the little Box Top for Education coupon and save it in (of course) a Ziploc bag. Over the course of the year or so that I worked there, we accumulated hundreds, if not over a thousand, Box Tops which she would then take to her son’s school. With each coupon worth 10 cents, that meant that every year the school got an extra $100 plus dollars. 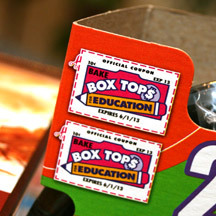 This year, Box Tops for Education and Safeway have teamed up to bring 2 Ways 2 Earn – a new program that makes it easier than ever to earn money for your school by combining Box Tops for Education and the “10% Goes Back to Schools” program. 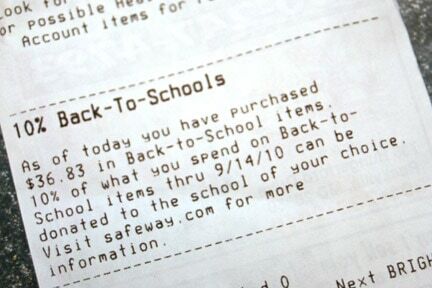 Between August 11 and September 14th, Safeway has labeled over 2,000 of their store items with special School Bus tags. When you buy one of those items, then 10% of the purchase price can be donated to a local school of your choice. I decided to shop with an eye out for the yellow bus at a recent Safeway shopping trip. 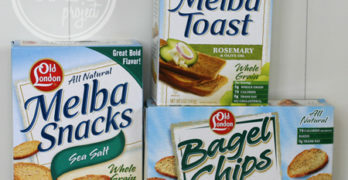 It seemed like most of the products that qualified were in the snacks, baked and dry goods aisles. Although I was pleasantly surprised that the new Bic pen I bought also gave me 10% back. 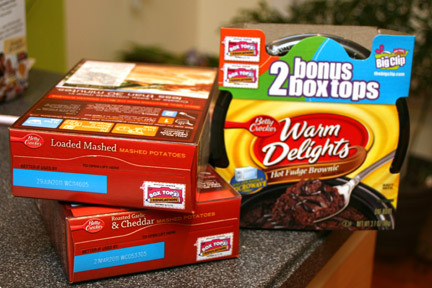 I thought it was a coup when I found a Betty Crocker Warm Delights that had a bonus Box Top on it (can you say SCORE?) Remember, that when you shop for the Box Top products, you are earning the 10 cent coupons in ADDITION to the 10% back that Safeway, so that $2.19 cake box is funding $0.40 to a school of my choice. The Box Top coupons are found on the corners or at the tops of the boxes of participating products and finding the coupoons could be a fun scavenger hunt for the kids! After checking out, I took a gander at my shopping receipt. The receipt shows a running tally of the amount of qualifying 2 Ways 2 Earn products that I have purchased. Starting September 18th, the receipts will give me a redemption code that I can use to donated the amount earned to a local school by visiting backtoschools.escrip.com. I think the cool thing is that this is my second shopping trip this month, and even though I didn’t know I was earning rewards, Safeway was keeping track of the sales. As of my last trip, I’ve purchased $36.83 worth of qualifying products which equales $3.68 for a school. So make sure you check your receipts in case you’ve been earning cash without knowing it. With school budgets being cut across the country, the 2 Ways 2 Earn program is a great way that we can help fund our schools by doing our usual shopping. You don’t have to buy things you don’t normally buy and you don’t have to spend any extra money out of pocket. As an added bonus, as part of Safeway’s “10% Goes Back to Schools” program, they are hosting the Safeway Bonus Box Tops Sweepstakes which gives the chance to win 1,000 bonus Box Tops (which is an extra $100!) To stay up-to-date on the lates Box Tops news, then you can “Like” Box Tops for Education on Facebook. The WiC Project 2 Ways 2 Earn Box Giveaway! One winner will receive a $25 Safeway gift card (also valid at Dominick’s, Tom Thumb, Randalls, Vons, and Genuardi’s) plus a 50 Bonus Box Tops certificate. Take a look at the products that have the Safeway “10% Back-to-School” yellow bus tags and share in the comments below which products you might buy. Giveaway ends at 11:59 PM EST, September 14, 2010. Disclaimer: This post consists of my (and/or fellow tester) opinions only. No compensation was given for this review/giveaway. I did receive a free “Safeway Back-to-School” prize pack and information from Safeway and General Mills through MyBlogSpark to use and test for the purposes of this review. This did not affect the outcome of this review. I’d get Cheerios and go-gurt. I would get Hamburger Helper and Nature Valley Granola Bars. Definitely gogurt…my kids love it. I’d get Nature Valley Granola Bars and Cheerios. I’ll be looking for Cheerios and Nature Valley granola bars. I like the Green Giant Veggies and the Pillsbury biscuits…Faves in my house. I subscribe via RSS on Google Reader! Thanks for the giveaway! I’ll definitely stock up on Cheerios, Pillsbury crescents and Nature Valley granola bars! nature valley granola bars which we eat everyday! I plan to buy Cheerios and Hamburger Helper. I would get Hamburger Helper and Cheerios. Totinos pizza rolls and gogurt. I will buy the Nature Valley Granola bars and the Cheerios! I would get Cheerios and Honey Nut Cheerios. I’m buying Honey Nut Cheerios, Hamburger Helper and Nature Valley granola bars. I always buy Huggies Wipes. Cheerios are good too. I would buy Ziploc bags. I’ll be looking for Cheerios. I plan on buying Hamburger Helper and Fruit Roll Ups! I would be looking for Cheerios and Hamburger Helper. I’d buy Cheerios and Juicy Juice. I’d get Cheerios and Hamburger Helper! I will be buying Nature Valley Granola Nut Clusters, Honey Nut Cheerios and Hamburger Helper. HB Helper and Cheerios are always on my list to get. I might buy the Betty Crocker Warm Delights. Chex Mix & Suddenly Salad. I’d get the Multigrain Cheerios…they mare our favs, not too sweet. We ear them almost everyday. Some Nature Vally Granola Bars too. We like the sweet & salty kind, thanks. I’ll definitely stock up on Cheerios. i would buy Cheerios , Juicy Juice and gogurt. I’ll be buying Nature Valley Granola Bars and Honey Nut Cheerios. Kleenex & Cheerios would be 2 of the prime products. I might buy the Nature Valley Nut Clusters, or stock up on Cheerios! I’d be headed straight to the cereal aisle for Honey Nut Cheerios!! I’m going to buy totinos pizza rolls 🙂 Lots of pizza rolls. Though I’m a bit ’embarrassed’ to admit it, my family and I are ‘Cereal Junkies’ and ‘Cheerios’ and ‘Lucky Charms’ are two of our ‘favorites’! So those are the 2 products I’ll be buying! Thanks for the chance to win and Good Luck to all! I follow your blog via email subscription! Pizza Rolls and Scooby-doo Fruit Snacks! Cheerios and Fruit Roll Ups, thanks for the chance! Thanks for the giveaway…we will be shopping for Kleenex, Cheerios, and Green Giant frozen vegetables. My kids love Honey Nut Cheerios. The kids all love Cheerios (so does daddy!). I’d like to get Cheerios and Kleenex. Thanks for the contest. Cheerios and plenty of em! I’d get Cheerios and Nature Valley Granola Bars.